To smoke a brisket, you have to commit yourself. Smoking a brisket takes a lot of time, and requires the outlay of more than just a few dollars of your hard earned cash. You might even have to set your alarm clock to wake you in the wee hours of the morning to get that brisket cooking in time to have it done for supper. But you'll realize that it's worth all the hardship when you finally bite into a piece of that smoky, bark-covered beef that's dripping with juice and just melts in your mouth. Yep. Totally worth it! Before we get into how to smoke a brisket, let's buy one. I prefer starting with a whole brisket because it includes the juicier point section, but a trimmed brisket flat is much more convenient. If choosing a whole brisket, look for one that has a quarter-inch to half-inch thick layer of fat. If it's thicker, you can trim some off. Here's a little trick to tell how fatty a cold brisket is...the stiffer it is, the thicker the fat. Also, look for marbling…fat mixed in with the meat fibers. The greater the marbling, the more tender and tasty the meat. The surface fat and the marbling melt as the brisket smokes, marinating the meat and keeping it moist. 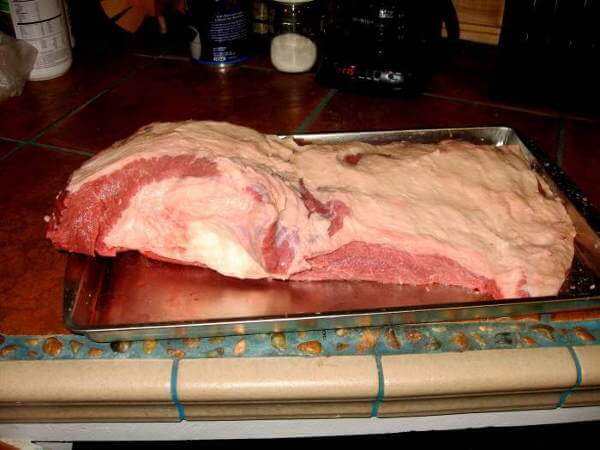 An untrimmed whole brisket can weigh ten to fifteen pounds or more. If you don't want to smoke it all at once, halve it, wrap it well, and freeze part of it to smoke later. Much of knowing how to smoke a brisket is knowing how to buy a brisket. Unpack the brisket and let it drain in the sink for five minutes or so.Trim the fat so it's one-quarter to one-half inch thick. At this point you have the option of leaving the brisket in its whole state or separating the flat and point before it's seasoned and smoked. Score the fat in a cross hatch pattern, just down to the meat fibers. By doing this, marinade and dry rub flavors can reach the meat underneath the fat cap, resulting in a more flavorful smoked brisket. Once it's trimmed and scored, you can marinate it, rub it down with your dry rub, or do both. Use a marinade or one of these brisket rub recipes, or use one of your own. Don't be afraid to put a lot of seasoning on a big beef brisket. As it's smoked for hours and hours, much of the seasoning on the surface will be washed away by melting fat and dripping juices. Marinating is easy. Mix up your marinade, and pour it over the brisket. Make sure to use a non-reactive container…glass, plastic, or stainless steel. If the brisket isn't totally submerged, turn it over every couple of hours. A large plastic food storage bag makes a great marinating container, too. You can use an injector to pump some of the marinade into the brisket. I usually pump a little marinade under the fat layer…no more than one-quarter cup into the entire brisket. When smoking time arrives, let the excess marinade drain from the brisket. For extra flavor, shake on some dry rub or pepper. When I use my water smoker, I pour the leftover marinade into the water pan to give the brisket more flavor as it merrily smokes. To season a brisket, you rub it, wrap it and rest it. After the brisket has drained, place it in large pan. I will use anywhere from one-half to one full cup of dry rub on a brisket, depending on its size and the level of flavor I want. Rub the spice mix onto the brisket and into the scores. Scoring the fat cap lets the rub flavor reach the meat on that side. I usually turn the brisket a few times, hitting each side twice. Wrap the rub-coated brisket in plastic wrap, put it into the cleaned pan and refrigerate it overnight. Letting it rest for two days will get the flavor deeper into the meat. 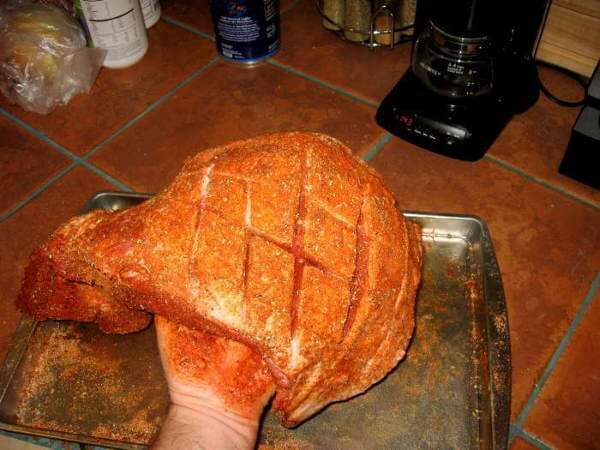 After resting, unwrap it and put it into the smoker. There's quite a bit to knowing how to smoke a brisket. We've bought it and seasoned it…now it's time to learn how to smoke a brisket. Beef is a flavorful meat, and with the additional seasoning flavors to boot, it'll take a good dose of smoke to balance it all out. My personal preference is white oak for smoke. 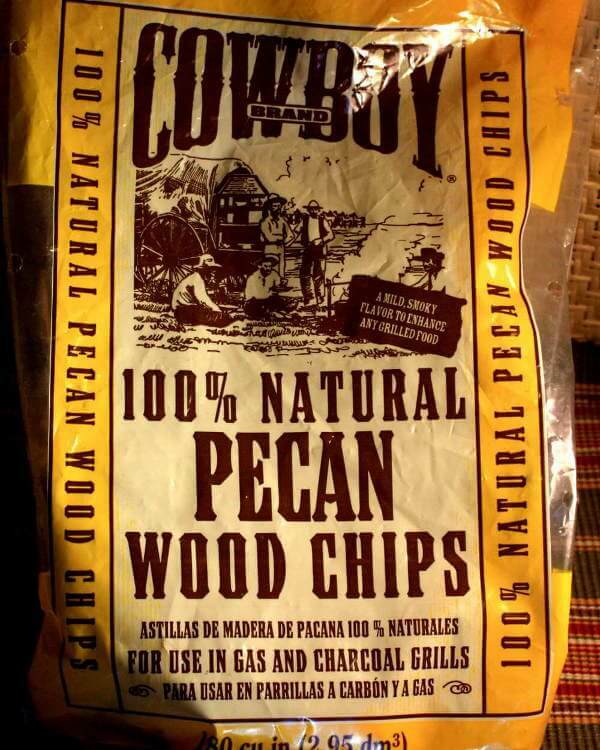 I'll use hickory or pecan if I don't have the oak. Use one of these, or your own favorite. Smoke for the flavor you want. 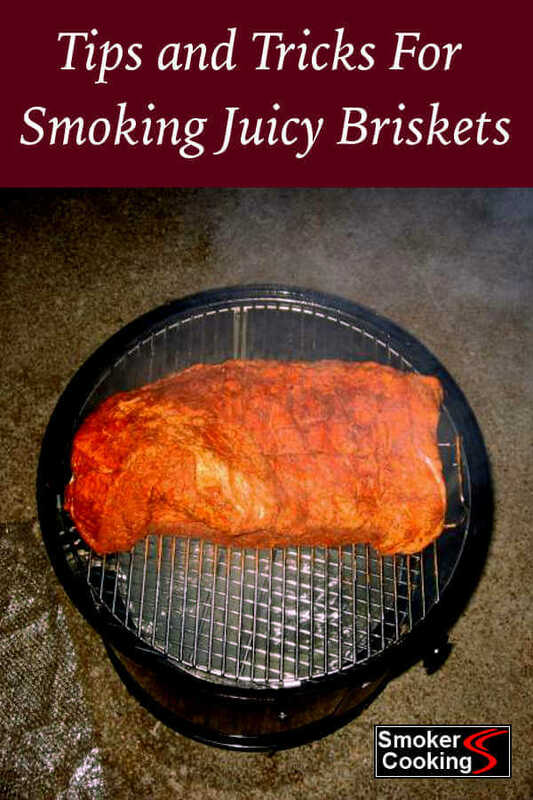 How To Smoke a Brisket ? 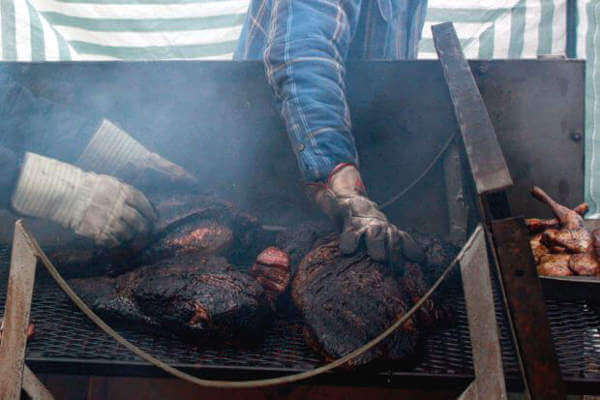 Briskets require many hours of low temperature smoking to reach their ultimate taste and texture. A rule of thumb is that brisket needs one hour per pound at 225˚ Fahrenheit. It could take more or less time, depending on the smoker temperature and the inherent qualities of the brisket. I've used an vertical water smoker with excellent results. The steam from the water pan prevents the brisket from drying. When I smoke brisket on a pit smoker, I wrap it in foil after four or five hours to keep it from drying out. When the brisket reaches an internal temperature of 190-200 degrees, it should be fork tender and ready to eat. 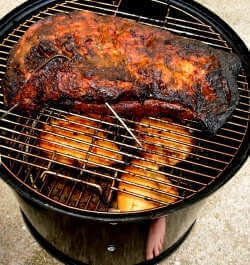 Some briskets are extremely tender when they reach 190˚, and others need to be cooked to a higher temperature. When your brisket reaches 190˚ F, stick a fork into it and give it a twist. You'll know if it's tender enough. If it still seems a little on the tough side, continue cooking it to 195˚ and check it again. Most are extremely tender when they reach this point, but you might come across a stubborn one every now and then that needs to be taken up to 200˚. Take it from the smoker and let it rest for at least 30 minutes to let the juices redistribute throughout the meat. For a short rest of 30 minutes, leave it in a pan or on a cutting board and cover it loosely with aluminum foil. But to get the most out of resting, re-wrap it tightly in foil and place it in a clean, dry beer cooler. Let it rest in the cooler for two to three hours, and you'll be enjoying some of the best brisket you've ever eaten! Mix up some mop sauce if you like, and baste the brisket every hour or so as it smokes. This will add flavor and moistness. 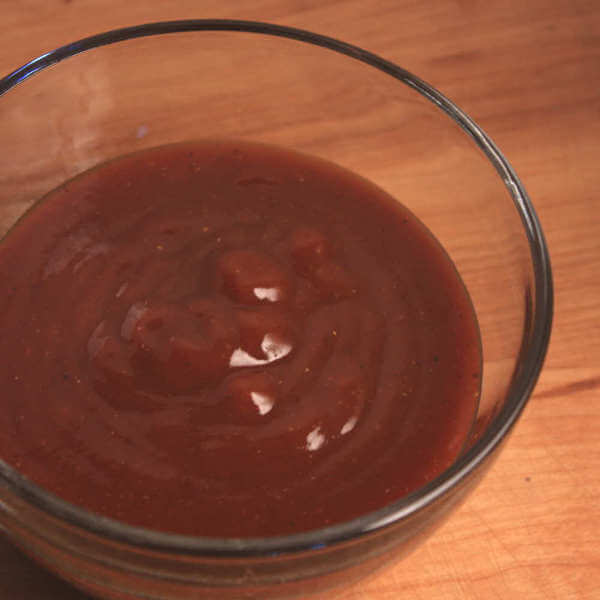 You'll also have time to make a batch of barbecue sauce while your brisket is smoking. A little homemade sauce on your brisket sandwich makes for good eatin'!